Craig Johnson at The Poisoned Pen! This wasn't my first rodeo. 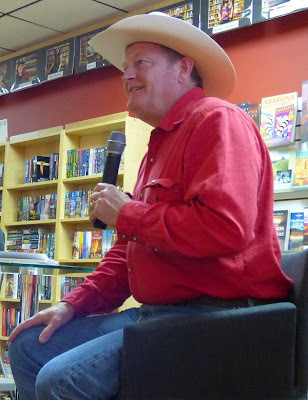 I knew that I had to get to The Poisoned Pen in plenty of time to get preferred seating if I wanted to see more than the top of Craig Johnson's hat. My only regret was that-- once again-- one of Denis's favorite authors was making his Phoenix appearance on a day Denis had to work. I did indeed get my favorite parking space, and I had more than enough time to get my reserved copies of Dry Bones and The Golden Age of Murder before roping a chair and making myself comfortable. I didn't bring a book with me, since I knew that I'd have Martin Edwards' book in my hot little hands, but as it turned out, I didn't even open it. I had a feeling that my favorite octogenarian would be there, and I was right. In fact, she was almost as early as I. We had a wonderful time chatting about books, television, genealogy, life, and anything else that struck our fancy while we waited for the event to begin. My friend had printed out a page from her genealogy to show Craig because-- wait for it-- she has a Longmire in her family tree! How cool is that? Host Barbara Peters came out a few minutes early to talk to us while Craig finished signing books in another room. While one of the staff members did a quick equipment check, Barbara told us that she'd been the store's only employee for the first two years it was open, and she had to do everything. "Now I can't ship a package or swipe a gift card. It's very disheartening." By the excited hum that started at the back of the bookstore and was moving its way up, I knew that the hero of the hour had arrived. 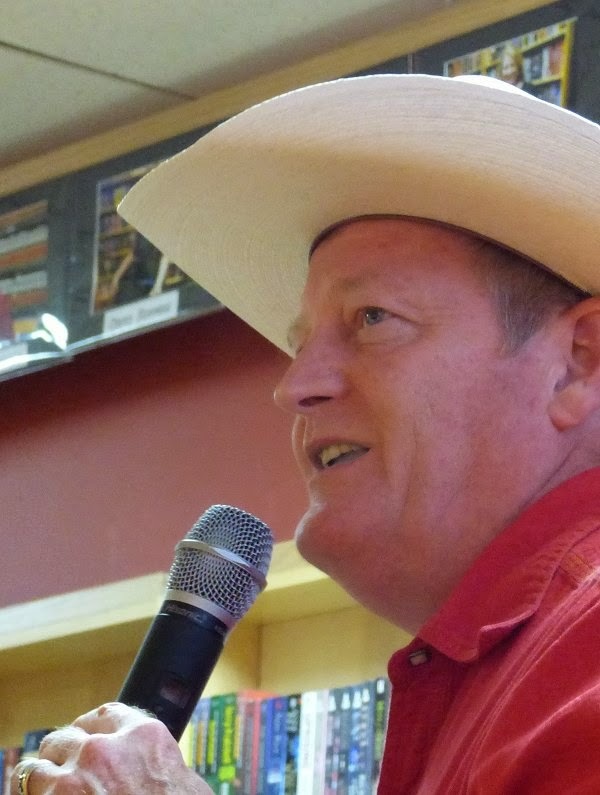 Craig Johnson has come to The Poisoned Pen for every single one of his books-- even when his publisher wouldn't foot the bill and he had to travel from Ucross, Wyoming, here to Phoenix on his motorcycle. Craig began by talking about the cover of Dry Bones. He really likes it. "It was another one of those covert operations between me and the artist who lives in Nashville. You know, trying to find the artist who does your covers is like trying to find someone in the Witness Relocation Program. Publishers really don't like it when authors and artists get together and gang up on them, which is exactly what we did." Barbara-- who wears a perpetual smile whenever she interviews Craig-- urged him to tell us about the Tony Hillerman Short Story Prize. "My wife Judy saw the announcement for this and showed it to me. 'You can do this,' she said. "I told her, 'I don't know. I've never written a short story.' Then I left the house to get some work done. Now anyone who's ever shoveled out a barn knows you have lots of free time for your mind. So I thought about it, wrote something up, and handed the first draft to Judy. "'You can do better,' she said. So I worked on it, sent it in, and forgot about it. Then I get this phone call from Anne Hillerman asking me if I was going to be in Santa Fe on a certain weekend. When I said that I wasn't, Anne said, 'We'd really, really, really like you to be there.' It never occurred to me that I'd won. I just thought I was on the short list. 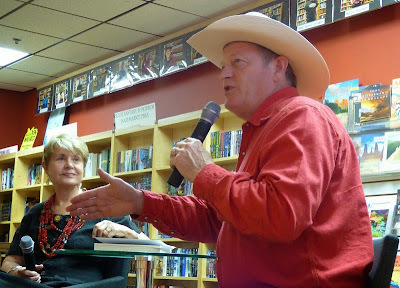 And that's when I got to meet Tony Hillerman. 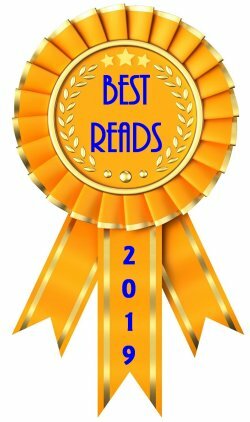 "I was proud when Tony Hillerman told me, 'The Cold Dish was the best book I read last year. It should've won the Edgar.'" 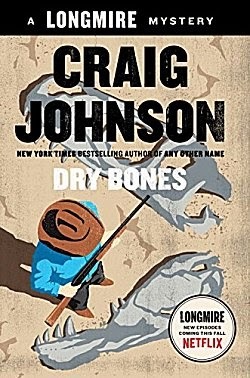 The genesis of Dry Bones came during Craig and Judy's travels in other countries while on tour for his books. They visited the London Museum of Natural History, and the plaque on the T. Rex skeleton said that it came from Wyoming. After visiting natural history museums in other countries (granddaughter Lola was with them), Craig said, "It seemed that all the T. Rexs around the world were from Wyoming. That made me do some research. You all remember a T. Rex named Sue?" Almost all of us nodded our heads. "When the skeleton-- which had been named Sue-- went up for auction, the Field Museum in Chicago was fighting it out with an Arab sheik who wanted it for his entryway or something. Now, the Field Museum may have big shoulders, but it doesn't have deep pockets, so it needed help if Sue was to come to Chicago to live. Sure enough, McDonald's and Walt Disney underwrote the Field Museum's $8 million bid, and Sue went to Chicago." Those of us who bought a copy of Dry Bones also received a #SaveJen pin which was designed by Judy's cousin (who also designed the original Absaroka County emblem). 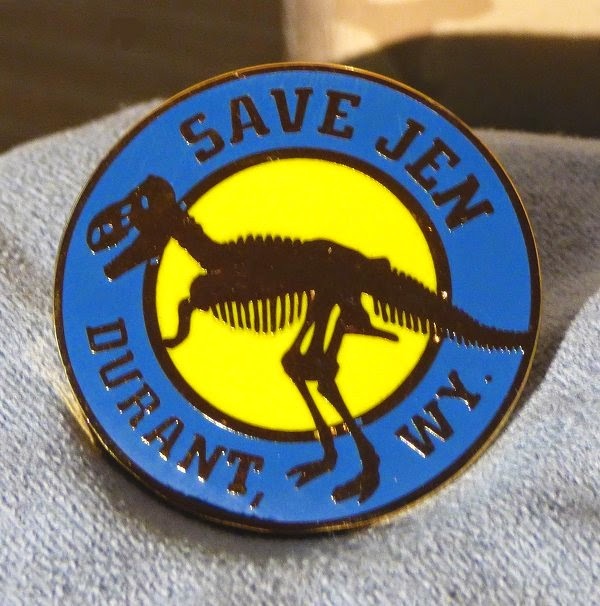 Hill City wanted to keep Sue, so the #SaveJen pin is a take-off on that. Craig smiled and said, "I don't know how many protagonists out there are having grandchildren like Walt is. I'm rather proud of that. It's more realistic. I figure I'm getting older every day, and I don't see why Walt should get a free pass." "My book takes place in Hulett, Wyoming, which is right across the border from Sturgis. Its population is 396 souls with a police department of one. They're expecting over 50,000 bikers in Hulett this summer, and I thought they just might need Walt and Henry's help." Before moving on to another topic, Craig let us know that his favorite source of stories is sheriffs-- particularly ones who are retired because they don't have to worry about being re-elected. 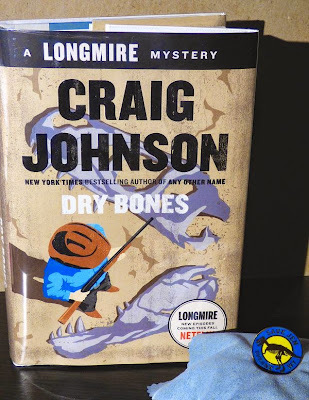 You can't talk about the books anymore without talking about the Longmire television series, which was cancelled in a bone-headed move by A&E. ("Bone-headed" is my choice of words, not Craig's.) A social media uproar ensued which led to the series being picked up by Netflix. "Netflix's opinion was 'if it ain't broke, we're not going to fix it,'" Craig told us. "They're only going to add 20 minutes of content per episode-- no commercials-- and all of the new episodes will hit at the same time this fall. But you're all going to watch just one episode per week-- right?" From the sound of the laughter in the room, I have a feeling that most of us intended to binge watch when those new episodes are available. "Pay channels are the only ones that are willing to take chances. You can see it with Game of Thrones, Outlander, and other series that are doing so well," Craig continued. "The people in charge of pay channels seem to remember that there are folks like writers-- and things like books." He's often asked if he's going to do any cameos for Longmire. "No. No cameos. My acting ability peaked when I was five and could play a dead guy." Last year, Craig and Judy were on the road promoting his books for more than 200 days, which led Barbara to compare Craig's schedule to recently deceased B.B. King, who was known to make 341 appearances in one year. Barbara also wanted to know if there was going to be a Christmas novella this year. "No, there won't be one this year," Craig replied. (Huge groans from the audience.) "Judy and I were on the road too much, but I have an idea in my head. 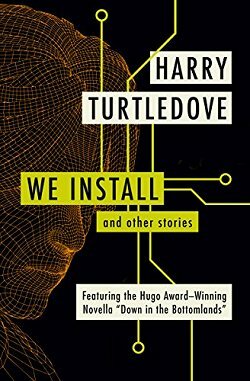 I'm fifteen chapters into the next book, and in a couple of weeks, we'll be home and I'll get that finished and start working on a novella for next year." "From 1948 to 1972 the Wyoming Sheriffs Association's yearly junket was held... on a train!... that went from Cheyenne to Evanston on the other end of the state and back. 1972 was the first year that Lucian Connolly had hired Walt Longmire. Every sheriff was allowed to invite one guest-- which led to quite a few altercations-- and one of the young sheriffs looked at Walt and said, '24 armed sheriffs on a train!' Walt replies, 'Yeah. When we started.'" "STOP THERE!" Barbara demanded because we all wanted to know more. Craig also told us a bit about Longmire Days in Buffalo, Wyoming. Thousands of fans show up for it. "I know one of these days, I'm going to be writing a book about a TV show coming to Durant to film. There's no doubt in my mind that's going to happen somewhere down the road," Craig said with a laugh. "We have all these events during Longmire Days," Craig continued. "There's a poker run. There's trap shooting. They have a parade. There's a softball game between the Cowboys and the Indians which is really not fair because my buddy Marcus Red Thunder gets every ringer softball player from every reservation in Montana to play on the Indians team. It's like the Cowboys are playing the '27 Yankees, and they get slaughtered every year. I swear we're going to have a special t-shirt made up for the Cowboys team that says 7th CAVALRY! "Robert Taylor who plays Walt Longmire in the TV series has won the Longmire Cup for trap shooting the last two years running. He's really, really good," Johnson said, "which was a shock for all the Wyoming enthusiasts that this actor could shoot so well. Of course, he's got a five-year-old daughter, so he's getting some practice in. The Longmire Cup is a big trophy-- but it's got a Rainier beer can on the top." Route 66 was also mentioned. Europeans are fascinated by it and think that they're going to find charming little motels and quirky restaurants all down its length. Craig keeps trying to tell them that the interstate system ate at least half of Route 66, but they don't seem to be listening. 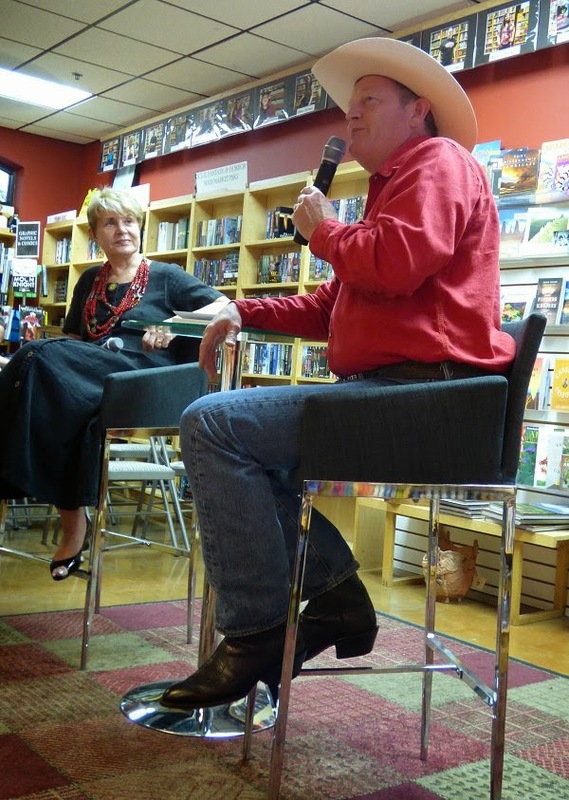 This is when Barbara mentioned that she and her husband will be taking author Dana Stabenow to La Posada (in Winslow, Arizona on Route 66) to eat at the Turquoise Room ("one of the best restaurants ever") for Thanksgiving. Stay tuned for a future giveaway! Craig's books have now been translated into Bulgarian. 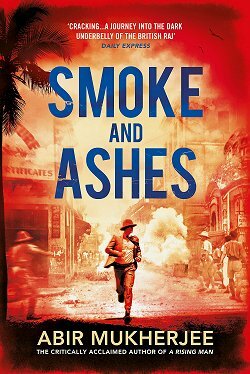 "I held one of the copies in my hand and said, 'I do not see my name anywhere on this cover,'" Craig laughed. When asked about his writing, Craig said, "It's a joy to do it. I really love writing. It's like breathing to me." I don't know about you, but that kind of sums up how I feel about reading his books. As usual with a Craig Johnson event, the evening was over much too soon, and it was time for the crowd to line up to get their books signed. If you are fortunate enough to attend one of his events, be forewarned. The line to sign his books moves very slowly. Everyone wants to share anecdotes with this very personable man. I tried to conduct a fast sign-and-dash (just to be different), but Craig wasn't having any part of it. 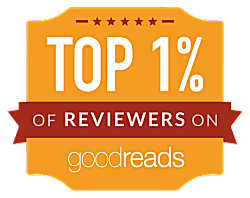 Maybe it's because I'm one of those Book Blog Ladies. 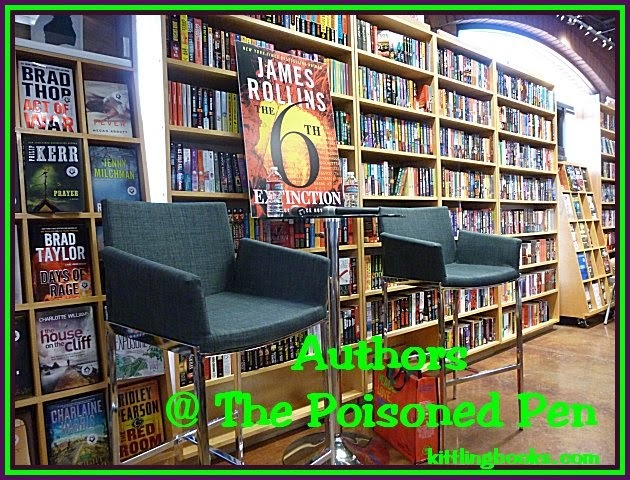 For any of you who would like to experience the next best thing to being at The Poisoned Pen for this event, I encourage you to watch it on Livestream. That way, you'll get every single bit of awesomeness! Craig Johnson?! Poisoned Pen?! Put them together and I can't see how you'd have anything but a great time, Cathy. Thanks for sharing. You're right about that, Margot. I'm glad you enjoyed my recap! Judy must be quite a person and a lot of fun, too. is on that system now. And yes to that cover! That series has terrific covers. Of all the authors I've now seen at The Poisoned Pen, I have to say that Craig is the best. Guaranteed first class entertainment each and every time.